Kiwis, you love social, but organic is dead. It's time to get personal. 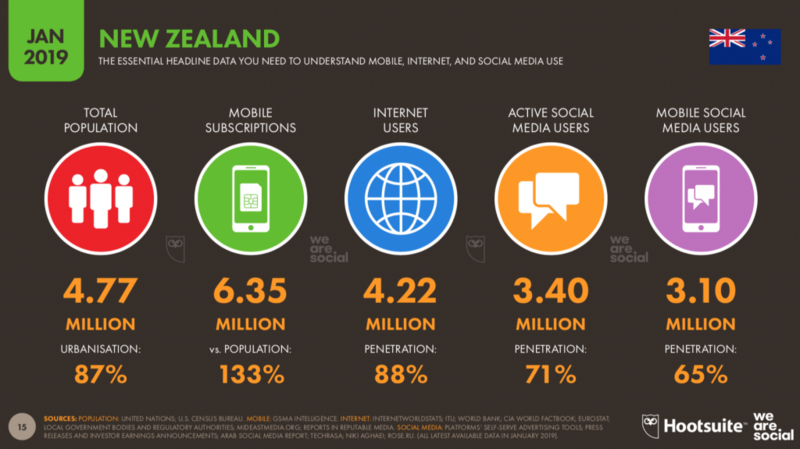 Close behind Hootsuite’s Global Digital Report, their breakdown on New Zealand’s social media habits has some good news, and bad news, for marketers. Hootsuite’s report didn’t net any big surprises. New Zealand is a nation online, with 88% having access to the Internet – nearly all of them using it daily. There are 1.3 mobile subscriptions on average per user. Most Kiwi Internet users (84%) access the Internet to find products or providers – which matches the global average, 70% of Internet users in NZ regularly make online purchases, not far behind the global average. Things get a little more interesting with our social media habits, however. 98% of Kiwi Internet users have visited or engaged with social media in the past month – matching the global average – with YouTube being our most popular social platform, with Facebook just a single percentage point behind. Facebook Messenger is our #3 social platform, up 13% on last year, showing that dark social is fast becoming popular as Kiwis opt to take their conversations into more private spaces. Other messaging platforms barely get a look-in; and after the top two, New Zealanders’ interest in social media is much in line with global trends. 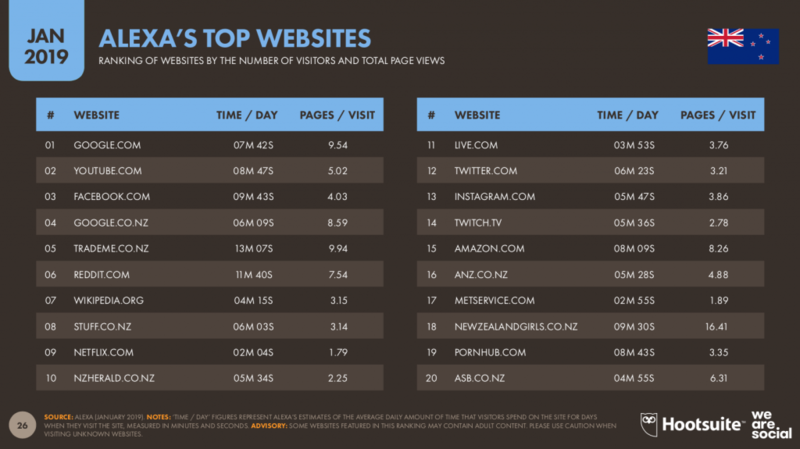 But the interesting news is that Kiwis are overall more engaged with content on Facebook than the rest of the world. By quite a margin. The engagement numbers get even more startling when split by gender. Kiwi women are almost twice as active with likes, and make three times more comments than men; perhaps lending some statistical weight to the stereotypical laconic kiwi bloke. This does beg the question – why are Kiwi women so much more engaged? While the report didn’t go into detail about NZ’s Facebook audience profile, our overall social media demographics follow the same bell curve as the rest of the world, so the difference seems more likely to be cultural than demographic. That’s the good news. The bad? 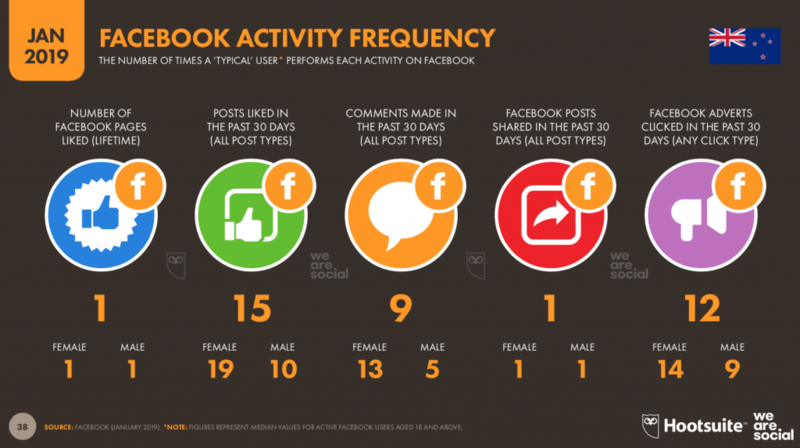 Engagement with Facebook pages, already low, is still dropping. Globally, an organic post on a Facebook page will fail to reach 94% of the people following that page – a 2.3% drop on the previous quarter. New Zealanders are a little easier to reach at 7.2% organic engagement, and 8.9% overall – but the engagement story is even worse. The average engagement with Facebook page post types in New Zealand: 4.16%. Photos had the highest engagement, at 6.57% of those who saw them. 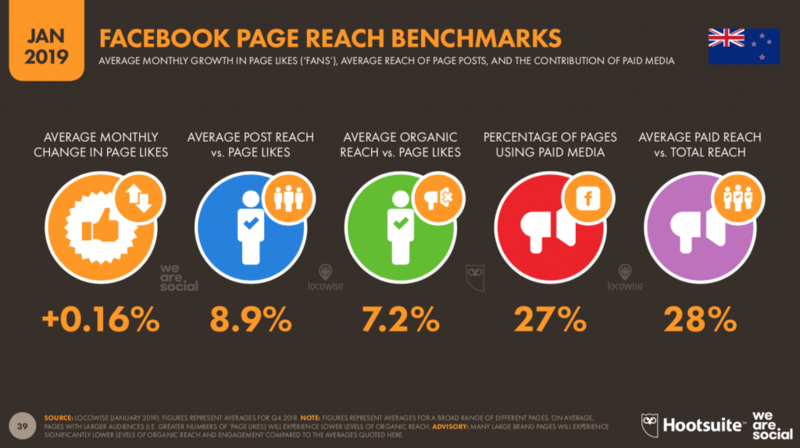 But the figures tell a story that people aren’t seeing page posts – and the few they do see, they’re not engaging with. This is no surprise to marketers. Facebook’s tactic of Pay to Play, whether or not it’s what the audience actually wants (it could be argued that liking a Page indicates a willingness to stay connected with that brand or topic) deliberately blocks most commercial content. This, of course, simply aligns Facebook with virtually all over forms of media, digital or traditional, in that the content is created (or curated) for the purpose of advertising space. Despite Kiwis’ use of ad blockers (45%, slightly lower than the global 47%) we are 50% more likely to click on the Facebook ads we see – NZ’s average was 12 ads clicked over the last 30 days vs the global 8. As with other areas of Facebook engagement, it was women who were more liberal with the mouse finger, over 50% more likely to click an ad than men. The opportunity to marketers and brands in New Zealand is pretty positive, considering. Here is a highly social audience willing to engage, not overly hostile to advertising. The trick, then, is to offer paid and organic advertising content that is relevant, personalised, entertaining. If it appeals to the Kiwi sense of humour or employs relevant cultural tropes, better still. New Zealand Police’s outstanding social media content is an unexpected example, but well worth the watch. True to insights offered in Hootsuite’s Social Trends report late in 2018, the NZ Police example shows that lo-fi is ok; simple production values combine with a simple idea, but excellent writing – including storification (Gaz and his two drinks) to create content that is shareable and authentic. The positive feedback of comments and reactions proves they’ve hit the right note. The fact that New Zealanders’ engagement in video is up 21% from just one year earlier shows that the play button is hard to resist. Meanwhile, ads that are stock-imagey, self indulgent, not relevant to their audience or fail to match the environment of the platform simply get ignored, switched off, or criticised. The final frontier for marketers is also the one where they should tread most carefully. As Kiwis (and the rest of the world) move to dark social, via private messaging, the temptation to reach them through Messenger broadcasts and chatbots will grow. Here, though, the advertiser is in the user’s personal space. This is the ultimate realm of personal relevance, and unwelcome intrusions are likely to go very badly indeed. The good news is that relevant, well crafted chatbots – even very simple flows – can net outstanding results. As a scaleable, conversational and personalised form of consumer engagement, messenger bots are just at the very dawn of their potential. … and that subheading isn’t in reference to the fact that NZ Girls and Pornhub ranked in the top 20 most popular websites for Kiwis. That surprising revelation from the Hootsuite Report is a whole topic in itself. The reality is that the challenge for marketers in social media is a tough one. Kiwis expect their advertising to be relevant and engaging. If it’s done well, they won’t just accept it: they will love it, share it, praise it. If it’s in-your-face, insistent, tacky, shouty or aggressive, they’ll block it. New Zealand is online and on social media; let the conversation begin.